My client, Deborah admitted to me that she and her husband have avoided intimate talks and difficult discussions for a long time. She said they talked about their jobs, the kids, the neighbors, the home – but they never spoke about the things that really mattered. They certainly never attempted to discuss the distance that had grown between them, nor the lover she turned to in her loneliness. To make that ongoing dance bearable, they would both drink quite a bit each evening to numb the sharp edges of the emptiness in their lives and in their marriage. And after a while, Deborah became a bit resentful. My client Jennifer had grown tired of the constant criticism and ridicule she felt every night when she walked through her front door. Her husband would begin nagging her immediately: “Where have you been? Why is this house always such a mess? You can’t do anything right, can you?” They couldn’t talk or connect. There was no tenderness or intimacy. Just anger and venom. That verbal abuse went on for years until Jennifer had finally had enough. It’s easier to walk away from a relationship in anger or hurt than in compassion, kindness, and love. It’s infinitely easier when there’s something to be pissed off or angry about. …But sometimes it’s simply the quiet whispers of our hearts that we can’t explain. What’s really, really hard is walking away from marriage in love. That requires you to say what you need to say without the promise of being heard or understood. It means expressing as best as you can where you recall the relationship falling apart for you and where you couldn’t navigate your way back. It even means – releasing your husband to find someone that can love him the way he deserves to be loved. Sure, it’s easier to be mad; you can take action walking away in anger. 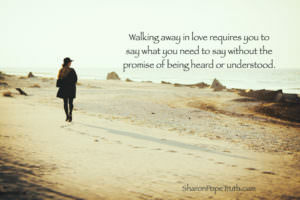 It’s much harder to walk away in love, but so much more powerful.